We’d love your help. Let us know what’s wrong with this preview of Little Girl Lost by Addison Moore. Allison and James Price move to the navy-blue forests of Concordia Idaho hoping to leave behind the chaos of Los Angeles and the painful memories of his indiscretions. Once settled in the picturesque town, where time seems to have stalled and life moves at a slower pace, their six-year-old daughter, Reagan, befriends a mysterious young girl who seems too idyllic to be true with her pressed pinafores, her perfectly curled pigtails. One late autumn evening, as their playdate winds down, both girls vanish into thin air. The little girl said she lived at the end of the street but the only thing Allison and James find at the end of the cul-de-sac is the gaping mouth of the forest. Their little girl, the mysterious playmate—they’re both gone. We were good people, my husband and I. We had everything you could ask for—successful careers, a stunning home with the requisite, yet clichéd, white picket fence, a precious daughter to call our own. We had secrets, my husband and I. Not many, so few, all of them lethal. I watch as James clasps his hands around the girl’s bird-like neck, squeezing hard until her flesh goes white—so hard you can see his bones bulge severely, stretching thin the skin at his knuckles. We were good people, James and I. It was true until it wasn’t. Published April 30th 2018 by Hollis Thatcher Press, LTD.
To ask other readers questions about Little Girl Lost, please sign up. It was going well until the explanation of Ota. Shouldn't the cops pick up on that one while searching about the girl? That twist was silly at best. The story was done well with flaws I could overlook. It got twist after twist after twist that at times, it's downright boring. Why I continued reading this drivel, I have no idea, but I did. While it's not the absolute worst book I've read, it's definitely close to it. What's wrong with Addison Moore's writing? Where do I even begin? The plot is ridiculously overwrought and simultaneously shallow. Character development is almost nil. The protagonists are horrible beings, incapable of evoking sympathy or any other emotion, except disgust and anger. Other characters are one-dimensional caricatures. The police are portrayed Why I continued reading this drivel, I have no idea, but I did. While it's not the absolute worst book I've read, it's definitely close to it. What's wrong with Addison Moore's writing? Where do I even begin? The plot is ridiculously overwrought and simultaneously shallow. Character development is almost nil. The protagonists are horrible beings, incapable of evoking sympathy or any other emotion, except disgust and anger. Other characters are one-dimensional caricatures. The police are portrayed as bumbling buffoons incapable of drawing reasonable conclusions or pursuing the most obvious leads. Reporters are stereotypically depicted as unprincipled vultures who steadfastly ignore the truth in favor of generating sensationalism (okay, maybe she got that one right). This book.... This book started out great! I was totally into it. It's different. A little heartbreaking. A true depiction of how one decision can spiral into the abyss. A missing child. Everyone is to blame, especially the parents. The parents who are grieving and just want their child back. I was turning the pages, engrossed in this mystery. The characters had me hooked into their story. I was right there with them, until I wasn't. At some point, the book took a wrong turn for me. The incidents This book.... This book started out great! I was totally into it. It's different. A little heartbreaking. A true depiction of how one decision can spiral into the abyss. A missing child. Everyone is to blame, especially the parents. The parents who are grieving and just want their child back. At some point, the book took a wrong turn for me. The incidents from the past just kept piling on. The weirdness started creeping in. The stretching of coincidences was just a bit too much for me. The author took this too far. Added too much of certain things (I am not mentioning them as to not spoil anything) that I found myself rolling my eyes. I'm still stunned by this entire book!! I was eagerly awaiting this release because it is a completely different genre for Addison Moore. But HOLY CRAP SHE NAILED IT!!! From one page to the next I couldn't put it down ! Confusion as to who and when events were happening! What an incredibly thrilling and suspenseful ride ! I was totally blindsided by the outcome. The story as a whole had me hook,line and sinker! Just WOW! This authors brilliant mind will leave you stunned. I love suspense/thriller books, and this one certainly hit the mark on being one. It kept me wondering up until the end about what was going to happen! Would definitely recommend it to my friends. Well what a fantastic read this was and so different, I just ploughed through it it was such compulsive reading. Well written, brilliant story and characters so no hesitation in giving it 4+ stars and well recommended. This was a good book!! Didn't want to put it down. I need to know what happened to the lil girl. I needed answers. Glad she was ok in the end. The book was well written and full of surprises. I recommend it to everyone. Can't wait to read more of her books. The story begins with the ending then dating back three months outlining the events that took place leading up that moment. When a married couple with a six year old daughter moved from LA to a small quiet town they thought it was safe to allow their daughter to play outside with the new neighbor. The story delves into the lives of multiple characters broadcasting their secrets, lies, and habits. The revelation of secrets is quite entertaining and not at all surprising with the nature of this story. Each character seemed to fall into place within this morbid tale. Nothing stays a secret when detectives begin probing into each of these individuals lives. With the focus primarily on family members, friends, and ex-lovers it was disconcerting for the sake of the missing girls. There is an equal balance of humor and morbidity. The characters speak of death in a blasé attitude showing very little emotion. I laughed a few times when these characters spoke about death as if it was no big deal. This story wasn’t anything like I expected. My preconceived ideas about these lost girls vanished after the media circus of events starting rolling in ex-lovers. The story focused on the parents more than the girls which was disappointing. The story got off track delving into mini topics and away from the investigation. I would not classify this as thrilling. I’d venture to say it was twisted and somewhat weird with the morbid humor about death. The ending was anticlimactic and weird. I lost interest once the reason was announced. There once was a time back in 2014 when I couldn’t get enough of Addison Moore’s books. Since that time I’ve lost interest. I really hoped this book would bring me back around. Unfortunately, this book only further instilled that my interests have grown. Sadly, I skimmed through the entirety of this book because it was too weird. This book is completely different from all of the other books of Addison Moore’s that I’ve read and whilst the cover completely draws you in, there’s not much that gives it away as to what this book is going to be all about. When I first started this book, I found myself struggling to get into the story, it just seemed that there was something lacking. However, as I got further into the book I found myself started to be more into the book, I was anxious to see what was going to happen. I have to This book is completely different from all of the other books of Addison Moore’s that I’ve read and whilst the cover completely draws you in, there’s not much that gives it away as to what this book is going to be all about. When I first started this book, I found myself struggling to get into the story, it just seemed that there was something lacking. However, as I got further into the book I found myself started to be more into the book, I was anxious to see what was going to happen. I have to say that Addison has taken a completely different approach than she normally does but in some ways it works pretty well for her. I’m intrigued to see if there is going to be a follow on book as it would be interesting to see what else happens and to find out if things carry on as normal. Alison has pretty much everything you could ask for, a loving husband, a sweet little girl, a family. What else could she want… Or so she thinks, her life is completely changed for good after she gets a knock on the door from her neighbour who delivers some life shattering news, she can hardly believe what she is hearing, yet she can hardly believe that it’s not true. With her marriage on the line, her and her family move away to try and start a fresh, however not everything is as it seems in the small little place she’s moved to. So like most real life cases when a child goes missing the first suspects are of course the ones closest. This story had me as a parent myself feeling the pain and worry of Allison as that would be any parents worse nightmare and I cried when emotions where running high. There so many scenarios that run through our heads in the space of seconds! Addison integrated this all beautifully into little girl lost. So many secrets come to light which just goes to prove they never good to ..... And then! So many secrets come to light which just goes to prove they never good to have in the first place! This innocent little girl is pulled into it, but is there more than one evil out to change her life forever? How far would each of us go to try save our child? And is all as it seems? Enjoyed reading little girl lost, different from other books by Addison Moore, yet still pulling us in to try solve the mysteries that this book has to unfold. Crime not normally a genre I read much of but as could put\imagine myself in main character role. So makes relatable if think of yourself in that position and mind frame. I can say without a doubt would go to any lengths we need to for our children. Took a few chapters to get pulled into this book unlike others but once you start u won't stop just the same. Addison Moore , You're writing really amazes me beyond words. This particular book though is so beautiful in itself that one cannot understand until they read and let the book unfold itself in front of their eyes . Littl Addison Moore , You're writing really amazes me beyond words. This particular book though is so beautiful in itself that one cannot understand until they read and let the book unfold itself in front of their eyes . I am still speechless after reading this book! Talk about putting a reader on the edge of their seat from the very first page! I was hooked from page one and constantly trying to figure out what was going on and who was doing what with all of the twists and turns throughout the story. My heart broke for Allison and James when their daughter vanished and no matter how much I thought I knew what was going to happen I was still surprised in the end. I have been a fan of Addison's since the first ti I am still speechless after reading this book! Talk about putting a reader on the edge of their seat from the very first page! I was hooked from page one and constantly trying to figure out what was going on and who was doing what with all of the twists and turns throughout the story. My heart broke for Allison and James when their daughter vanished and no matter how much I thought I knew what was going to happen I was still surprised in the end. A compelling read. You don’t know who to believe, James or Allison, or any one of their insane friends or relatives. There’s a wedge between husband and wife which only widens the gap between them. But when there six year old daughter doesn’t come home from a playdate, all the secrets and lies come out.The agony each feels over the disappearance forces each of them to come face to face with their demons, living and non-living. Ultimately this trial by fire burns away the wedge that di Compelling! I knew Addison Moore could write humor, paranormal, and romance. This book proves she's masterful at the thriller scene too! I purchased the ebook version of this story on May 5th, and was so glad I didn't wait to get the paperback as I sat up through the night reading (which is easier to do with my kindle). Once I started, I couldn't put it down! The story is full of characters you can't help but feel some sort of connection to, the plot will keep you engaged, and the twists and turns will blow I knew Addison Moore could write humor, paranormal, and romance. This book proves she's masterful at the thriller scene too! I purchased the ebook version of this story on May 5th, and was so glad I didn't wait to get the paperback as I sat up through the night reading (which is easier to do with my kindle). Once I started, I couldn't put it down! The story is full of characters you can't help but feel some sort of connection to, the plot will keep you engaged, and the twists and turns will blow you away. This isn't a typical Addison Moore rom-com book. I was a bit skeptical at first because suspense isn't my normal choice in books. I normally prefer rom-com and HEA. BUT I enjoyed this book very much. There are lots of twists and turns. Many layers and many red herrings. It keeps you guessing until the end. The ending surprised me a lot. Very well-written and well-plotted. I totally recommend it to all suspense book lovers. I am still waiting for the next paragon novel though! Addison Moore brings us a twisty, dark, psychological thriller with one heck of a twist! I am a big fan of Addison Moore's books and I knew going in that this was going to be different, but I didn't expect this! I am still reeling from this book. It completely absorbed me. I couldn't stop reading. I had to know how it ended. Nothing is as it seems. The story twists and weaves page after page building suspensefully towards the biggest twist of all! 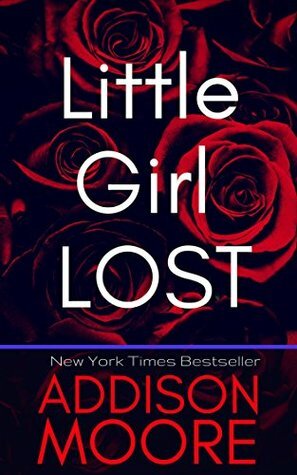 Addison Moore's psychological thriller, Little Girl Lost, is a fully engaged story that does not leave the reader second guessing their choice to read this novel. I have read numerous romantic comedies by this author and couldn't pass up to read one of her stories in a different genre/stance. I was not disappointed. This is a gripping story that is suspenseful and exciting. Great delivery from start to finish. This book had so many twists and turns. At first I wanted to dump it ..... but then I found some interest in the plot. I hated James .... Then I started to soften to his character ..... Then I just disliked him .... on and on with the like and dislike. Surprise ending. A good read. This book was really good. It had some weird characters to keep you on your toes and some that were really realistic. The story did seem to lag for me, others may have a different notion but I found it went smoothly. The ending was a complete surprise and a very interesting one. Read it, I think you'll enjoy it as much as I did. This is not your every day thriller - just about every character is exceptionally dark, messed-up, and morally and ethically compromised. But the fast-paced writing is exceptional--straight forward, yet witty and very imaginative. We get a deep look at the main characters inner thoughts which held my interest from the first page to the last. This book was excellent. There was so much going on that it was impossible to get bored. Talk about secrets, this story was full of them. Every time I turned around I found another surprise. This author really knows how to keep you interested.